As a storyteller and an improviser, I get asked about humor a lot. I was invited to speak to a company a few weeks back on this exact topic. That happens to all of us sometimes. The short answer? If you have great writers and improvisers at your disposal, go for jokes, parodies, even satire. Beware that satire, unlike parody, is aimed at social commentary, and that’s a bit heavier than aiming for levity. If that’s not your goal, don’t go there. When well-executed, it can work, though. (The key words being “well-executed!”) If you can pull it off, do it. But I think there are many other (easier!) ways to start. That leads me to the long answer: There are so many easy ways to have fun and show a little levity leg without doing lots of writing, pre-production, and post-production work. When you have budget for production and the time for deeper storyboarding, do it. But remember that story and fun trump production values every time in video. There are times you have neither a long runway to storyboard, script, shoot, and edit nor the budget to get super fancy. The good news is that you don’t need to. Start small, have fun, see what works, and then do more of the stuff that your audience connects with. Here are a few ways to lighten up, get your stuff out there, and learn quickly and more easily with video. Comedy (and joke-writing, specifically) is an art, and humor is an outcome. Playfulness and fun, however, are states of being. Everyone can be playful. What matters is being joyful and willing to improvise. When you experience those moments of humanity and joy at work, get your camera out. Ask other people to capture your moments so you don’t have to think about it yourself. For honesty and transparency, make sure it’s OK in advance with office storytellers pulling out cameras here and there. Everyone should know when it’s not OK, too. At one particular company, one person went crazy and started dancing after eating a pumpkin chocolate chip cookie, and someone recorded it. She was OK with it. It captured a light-hearted moment in the office that had nothing to do with work—but everything to do with being human and connecting with their audience. This woman also loves her pumpkin spice lattes at a particular coffee company, so I told her to capture that happiness, or have someone else do it for her. In another video I did for my business, I read fake letters from people who have questions. There was nothing on each card or letter—I completely improvised! However, I do go into each video knowing what big point I want to make. Think in bullets, not a script you have to memorize. Then, I just have fun. Sometimes the first take is the best. If not, no worries. Do a few takes and pick the best one. Improvise. Go off-script! Scripts work for longer videos, but for short videos, they can work against playfulness and spontaneity. Forget trying to be funny—be real. The truth is funny. If your group OK’s it, capture the funny (non-confidential) moments that happen during a brainstorm, as an example. People say and do funny things all the time, especially when they’re not trying. Talk to your kid about what he or she thinks you do. I gathered a group of kids (It was not storyboarded—kids don’t do scripts well) and just talked with them about why adults are so bad at explaining things. Kids really do say the funniest things. It’s awesome. No script, no planning. Be prepared for the unexpected. In this case, one kid said, “Blah, blah, blah,” and the other kids just imitated it. I went with it! You know the deer-in-headlights, formal side of people that comes out when the camera light goes on? All of a sudden, we’re speaking like that super-serious business professional no one would ever want to sit next to in a bar! Speak like you normally do. If recording yourself is tough because it brings out your inner business-speak grammarian, then ask someone else to interview you about your passion and record your answers. You can always edit out the questions later. Then, your eyes will light up with joy, excitement, and the inner awesome will beat up the inner robot. That’s what you’re going for: the way someone talks when they are alight with passion. You don’t have to do it alone. Sit and have a conversation with someone about something completely unrelated to work—maybe about something they or you love—and when you get that storyteller fire lit, start to record! People are funniest and most engaging when they’re not trying to be—when they’re just responding. The life of the party usually has a catalyst, something that he or she feeds off. It’s OK to help create conditions that lighten people up. If you’re up for some great sketch writing, you can do some fun fish-out-of-water scenes, where a person doesn’t seem to fit with the surroundings and chaos ensues. If it’s daunting to think about, no worries. You can use this same comedic device of contrast (and exaggeration) in a low-budget way. Imagine Bring Your Daughter to Work Day. Now put your kids on the phones and at the office front desk for a bit, and see what happens. Or, for a modern twist, how about Take Your Husband to Work Day? Have your husbands play up the fun. For one client, we used Millennial customers for a “board meeting” and recorded it. Exaggerate the situation—that’s where the comedy is. In the example where someone in the office recorded the woman doing her happy dance, it was hysterical to see someone get that happy over a cookie. The unexpected, unplanned, over-the-top response to something so mundane is hilarious, fun, and infectious. Speaking of Bring Your Husband to Work Day, that’s a great role-reversal! Have kids try to explain what you do or use business-speak. In one video, I gave each kid one line, creating the script right then and there with little preparation. Kids don’t need much to be funny! The fun is in flipping expectations. Have the boss be the admin for an hour and record it. Have the admin be the boss for an hour, and see what decisions he or she would make. Embrace the unexpected. 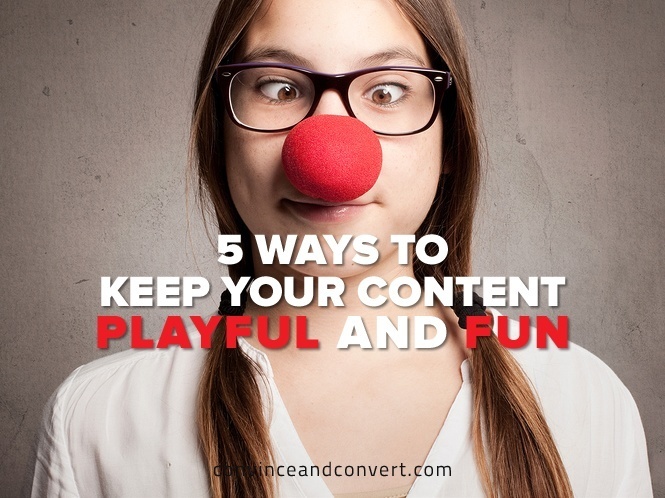 Humor can power your marketing and social media. I am a huge fan of using comedic devices—the comedy police from ComedySportz and The Second City would revoke my improviser card if I said otherwise. Yes, humor can be daunting at times. Don’t overthink it. Instead of forcing funny (and I am a big fan of it if you have resources), try a playful, improvisational, experimental approach first. You’ll get some great content, and you’ll learn what works in a less-risky way in less time and using fewer resources. Just start somewhere and have fun! Lights, camera… now ditch the script!